STAMFORD — In his 33 years as a police officer, Sgt. Robert Monck has seen a lot. But a helicopter landing on the third story of a Ludlow Street building? That’s something Monck doesn’t see everyday. “I do remember seeing one landing there — about 25 years ago,” Monck said. Monck was sent to the site after people in a nearby building called police. And sure enough, there was a helicopter on a beat-up wooden helipad. Finding the errant pilot was easier than expected. Karl Leinsing, who was in the city for a meeting, had left his business card in the machine’s door frame. Leinsing, 50, of New Hampshire, is president of A-Tech Designs Inc., which manufactures and consults on medical devices. He also works as an engineering consultant for lawyers. Monck gave him a call. “He said he thought it was a valid helipad,” Monck said. Leinsing said he used a Federal Aviation Administration map listed the helipad. He said he had permission to land on it and was also given the security codes to the building’s doors. City building officials, police, firefighters and the fire marshal were called to the scene and determined that the wooden pad, which had not been maintained, did not meet fire code standards. So Leinsing was not permitted to fly away. However, Leinsing said he was willing to buy fire extinguishers, remove or nail down the wood, soak it with water and foam and even make a donation to the fire department. But all those options were rejected. Instead Frank Compo and Sons Crane and Rigging was called to bring a crane to lift the copter onto a flatbed sent by Bill’s Service. But that didn’t solve all the problems. The height of the helicopter prevented the flatbed from driving on the highway. It was restricted to city streets. 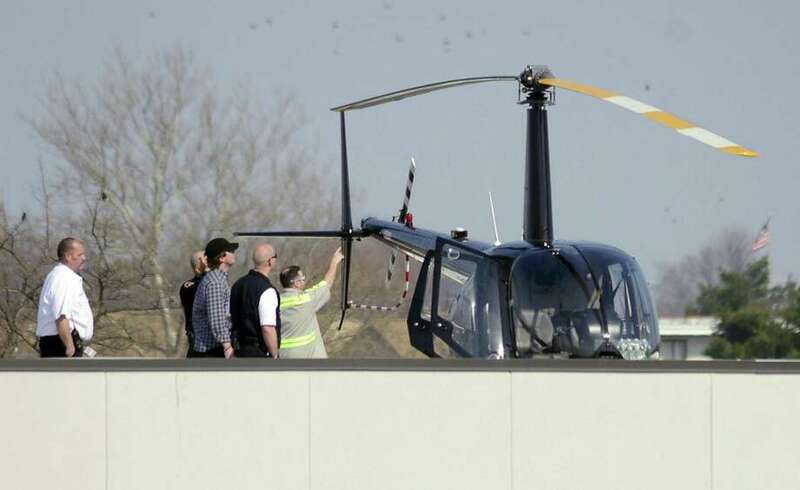 By 6:30 p.m., the helicopter was back in the air. Stamford police did not cite Leinsing. While Leinsing complimented Monck, the crane operation and the flatbed driver for their help, he said he does not plan to return to Stamford again.